Not to be confused with Dextran. Dextrins are a group of low-molecular-weight carbohydrates produced by the hydrolysis of starch or glycogen. Dextrins are mixtures of polymers of D-glucose units linked by α-(1→4) or α-(1→6) glycosidic bonds. Dextrins can be produced from starch using enzymes like amylases, as during digestion in the human body and during malting and mashing, or by applying dry heat under acidic conditions (pyrolysis or roasting). This procedure was first discovered in 1811 by Edme-Jean Baptiste Bouillon-Lagrange. The latter process is used industrially, and also occurs on the surface of bread during the baking process, contributing to flavor, color and crispness. Dextrins produced by heat are also known as pyrodextrins. The starch hydrolyses during roasting under acidic conditions, and short-chained starch parts partially rebranch with α-(1,6) bonds to the degraded starch molecule. See also Maillard Reaction. Dextrins are white, yellow, or brown powder that are partially or fully water-soluble, yielding optically active solutions of low viscosity. Most of them can be detected with iodine solution, giving a red coloration; one distinguishes erythrodextrin (dextrin that colours red) and achrodextrin (giving no colour). White and yellow dextrins from starch roasted with little or no acid are called British gum. Yellow dextrins are used as water-soluble glues in remoistenable envelope adhesives and paper tubes, in the mining industry as additives in froth flotation, in the foundry industry as green strength additives in sand casting, as printing thickener for batik resist dyeing, and as binders in gouache paint and also in the leather industry. a pyrotechnic binder and fuel; this is added to fireworks and sparklers, allowing them to solidify as pellets or "stars"
Owing to their rebranching, dextrins are less digestible. Indigestible dextrins have been developed as soluble stand-alone fiber supplements and for adding to processed food products. Maltodextrin is a short-chain starch sugar used as a food additive. It is produced also by enzymatic hydrolysis from gelled starch, and is usually found as a creamy-white hygroscopic spray-dried powder. Maltodextrin is easily digestible, being absorbed as rapidly as glucose, and might either be moderately sweet or have hardly any flavor at all. The cyclical dextrins are known as cyclodextrins. They are formed by enzymatic degradation of starch by certain bacteria, for example, Paenibacillus macerans (Bacillus macerans). Cyclodextrins have toroidal structures formed by 6-8 glucose residues. Amylodextrin is a linear dextrin or short chained amylose (DP 20-30) that can be produced by enzymatic hydrolysis of the alpha-1,6 glycosidic bonds or debranching amylopectin. Amylodextrin colors blue with iodine. (Beta) Limit dextrin is the remaining polymer produced by enzymatic hydrolysis of amylopectin with beta amylase, which cannot hydrolyse the alpha-1,6 bonds at branch points. (Alpha) Limit dextrin is a short chained branched amylopectin remnant, produced by hydrolysis of amylopectin with alpha amylase. 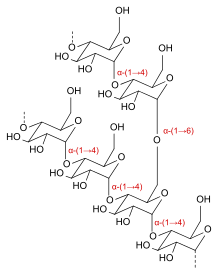 Highly branched cyclic dextrin is a dextrin produced from enzymatic breaking of the amylopectin in clusters and using branching enzyme to form large cyclic chains. ^ "Types of Fiber and Their Health Benefits". Look up dextrin in Wiktionary, the free dictionary.